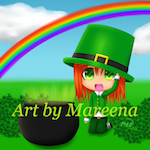 St Patrick’s Day cartoon drawing of a leprechaun girl in the anime art style. The leprechaun girl is wearing a bright green top hat encircled with a black strap threaded through a gold buckle. Look closely and you will notice the matching black belt with gold buckle strewn around her waste. Leprechaun Girl girl also wears a green bright coat with gold buttons. White cuffs fold over on the coat sleeves suggest she is wearing a long sleeved shirt beneath the jacket. The shirt’s v-shaped collar hangs beneath the neck line. A portion of the white shirt also peeks out from the belly area in the sh​ape of an upside down letter “v”. Also notable are Saint Patrick Day leprechaun girl’s large green eyes that look out at you like million dollar emeralds, the cute little freckles adorning her cheeks, and the way her little fingers hold her hat at an angle atop her reddish brown hair. You can adorn rooms with this beautiful piece or send it in card form. Prints are available in two sizes as outlined below.